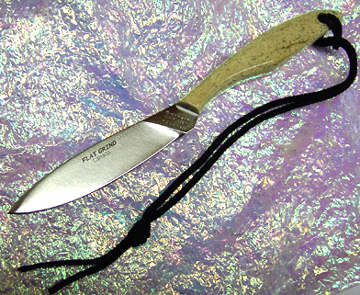 Curious about that knife you've always carried? 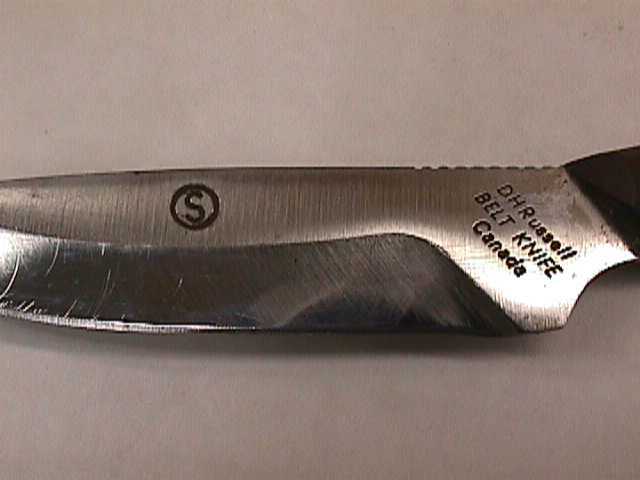 Wonder if the blades you use at work are Grohmann? 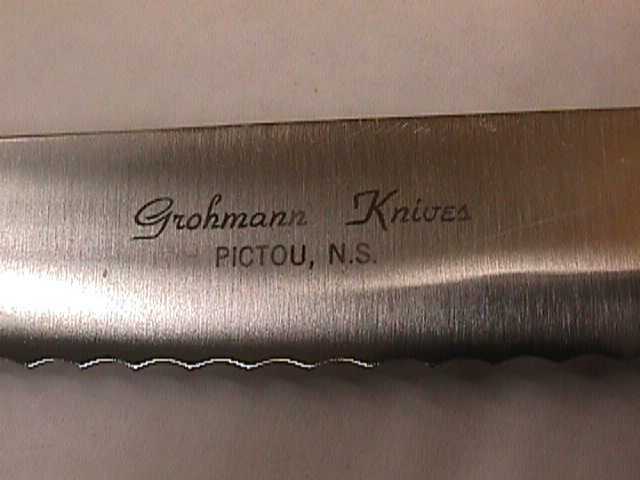 Is it a real Grohmann knife, or a copy? For instance, there have been around 16 copies of our Original #1 Design that we know of! 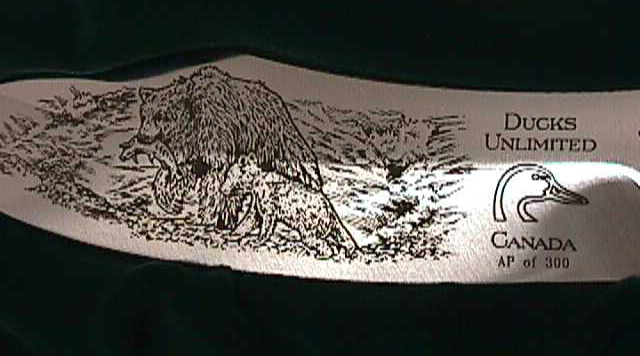 Below are some product pictures and descriptions to help you decide if you have the real deal or not, plus some special order items and other interesting facts through the years. R2S showing registered trademark "RD 1962" RD meaning registered, and the year that the model was registered. 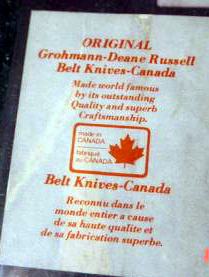 These knives were stamped for 20 yrs this way, so if yours has this stamp it could have been made anywhere from 1962-1982. 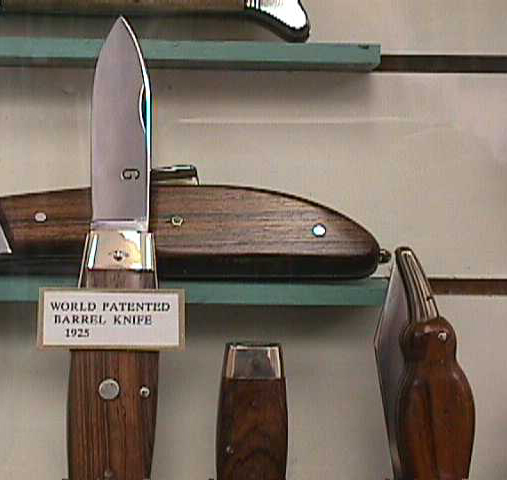 Brass Rivets were originally used in the knives, then nickel-silver, then aluminum and now back to brass rivets. 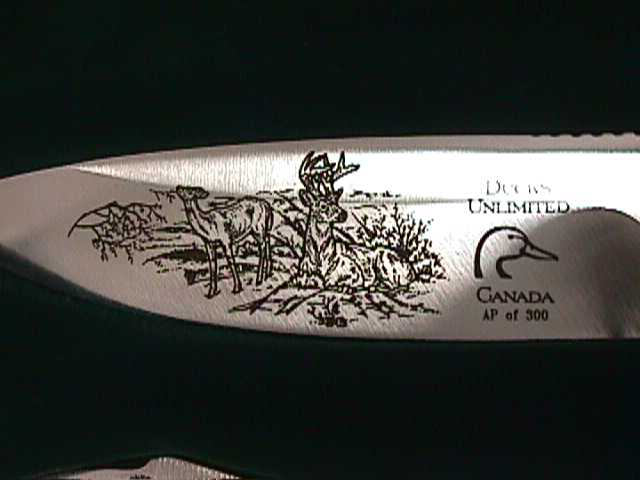 Centennial Knife- Grohmann issued a collector's Centennial Knife to commemorate Canada's 100th Birthday. 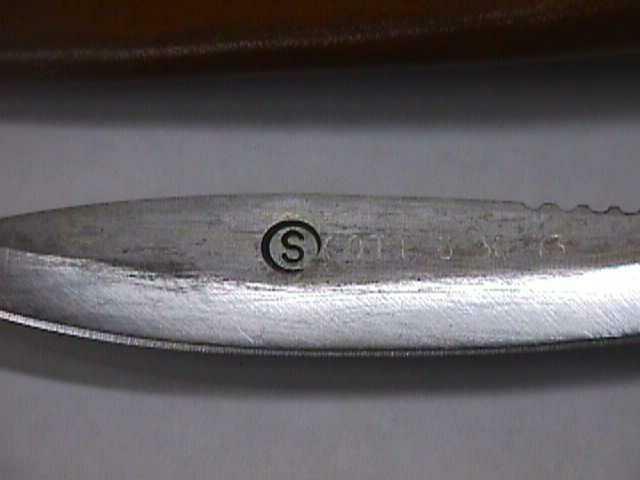 "S" in circle on front of blade (stainless), Russell BELT KNIFE Canada tang stamp, rosewood handle, nickel-silver rivets, and nickel-silver centennial medallion sunk into the knife handle, with CANADA, maple leaf picture and centennial dates 1867-1967. 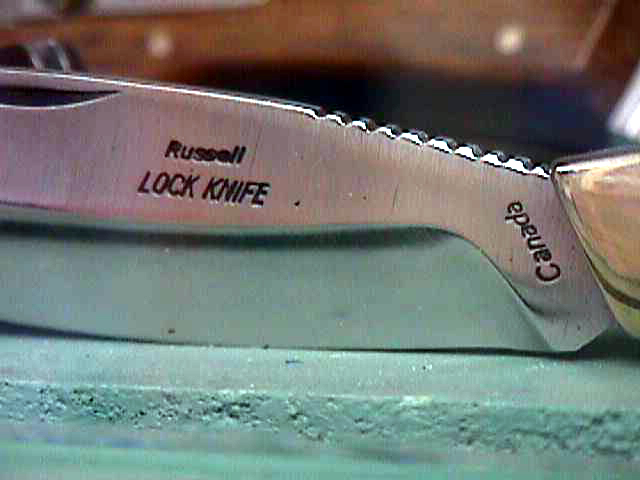 Winchester Knife - In 1980, Winchester Canada had a special one time offer of an Original Design D.H. Russell belt knife when you presented a proof of purchase of a firearm plus $17. 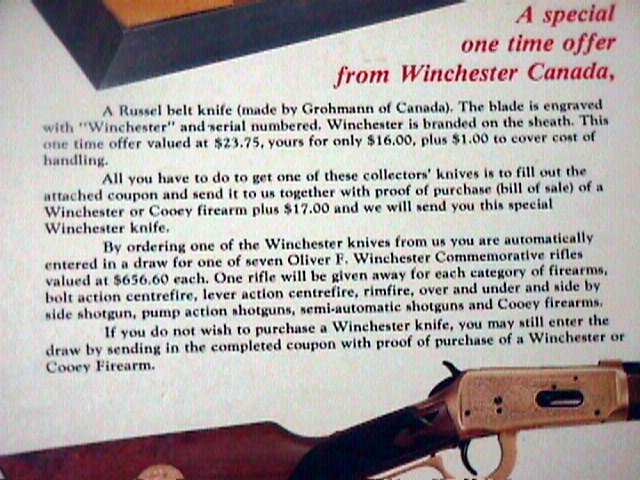 Purchasers were then entered into a free draw to win a commemorative rifle. 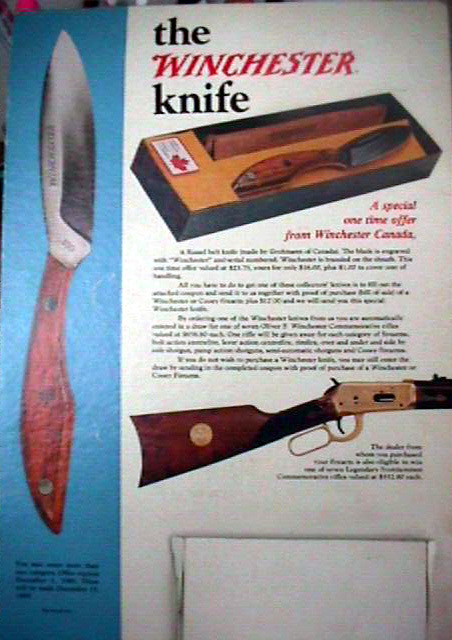 Stainless blades were engraved with "Winchester" and serially numbered, sheaths were stamped with "Winchester", rosewood handle, nickel-silver rivets, brown/gold gift-box. 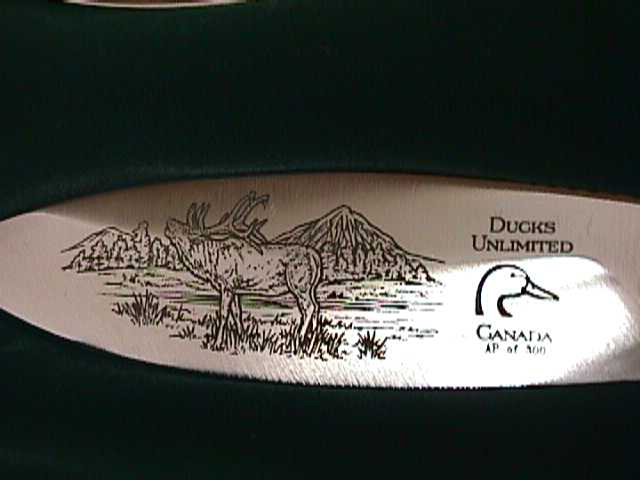 Ducks Unlimited- Various projects over the years including various Guide Series knives such as the #R3SS Boat Knife, Rosewood handle, Stainless blade, Sheath with pouch holding sharpening steel, and #R2SS Trout & Bird, Rosewood handle, Stainless blade, Sheath with pouch holding sharpening steel, with DU emblem on sheaths and blades. 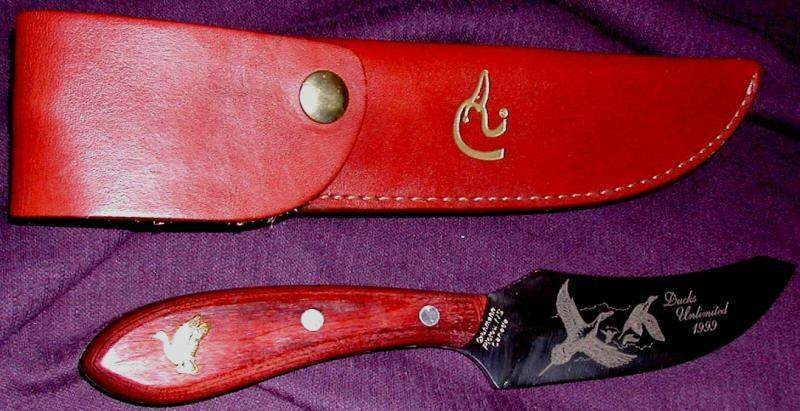 Hallmark Knives such as the #X100SA Large Skinner with Xtra resin handle, stainless blade, special maroon logo'd overlap sheath. 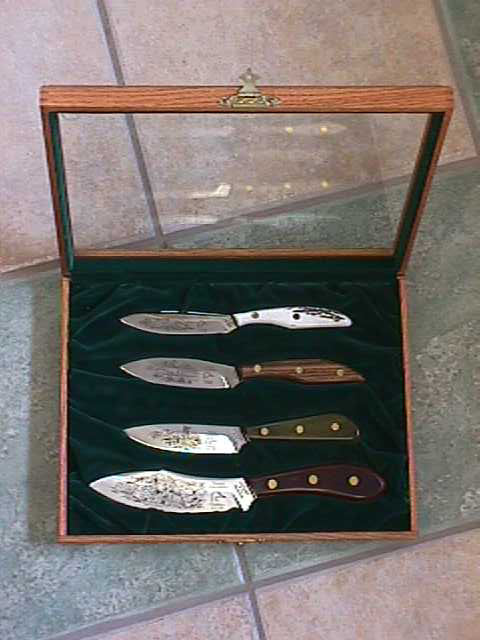 D.H. Russell Knife Collection: 4 Piece Collector's Wooden/Glass Boxed Set Limited Edition to 300 pieces- Featured R1S Original Design, brass rivets, rosewood handle, laser etched with Elk scene, H2S Trout & Bird, brass rivets, staghorn handle, laser etched with trout underwater scene, X3S Boat, brass rivets, green Xtra resin handle, Whitetail deer scene on blade, and X4S Survival, brass rivets, maroon Xtra resin handle, Bear scene lasered on blade. 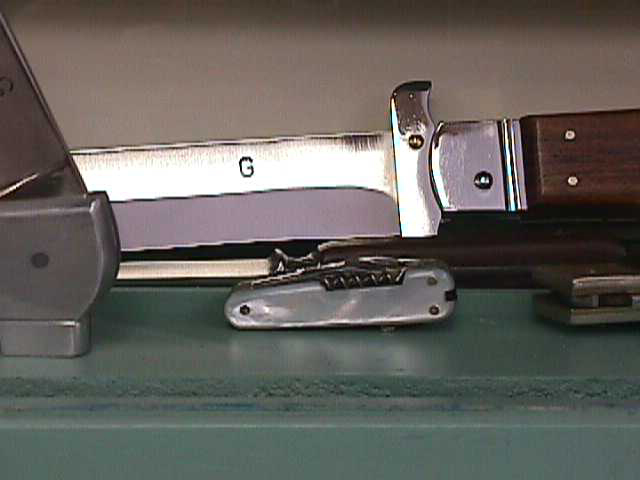 A knife for a Boston outdoorsman to hold his insulin and hypodermic needle, no tool was needed to get at the insulin, and the handle was waterproof. 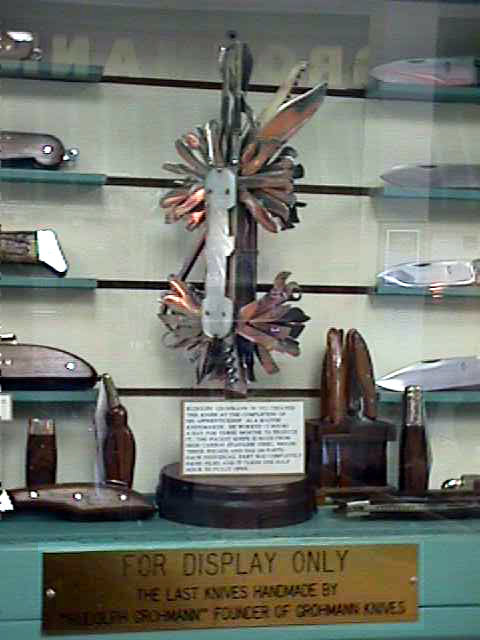 One-arm handicap knives that included a small fork on the end of the serrated blade, used to both cut and pick up food with one hand. 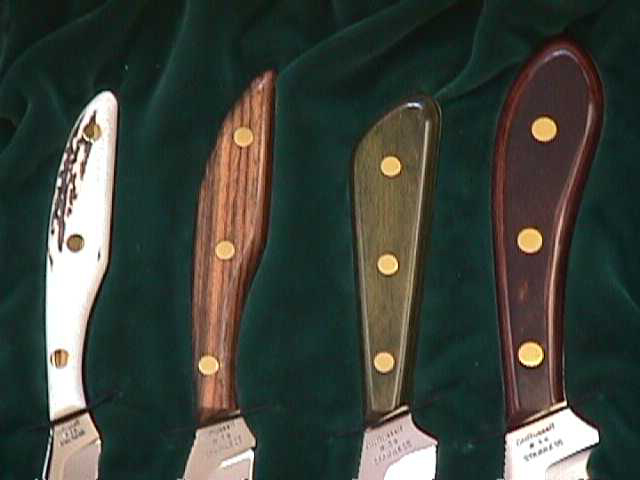 Whale flensing knives to cut whale blubber/perform autopsies. 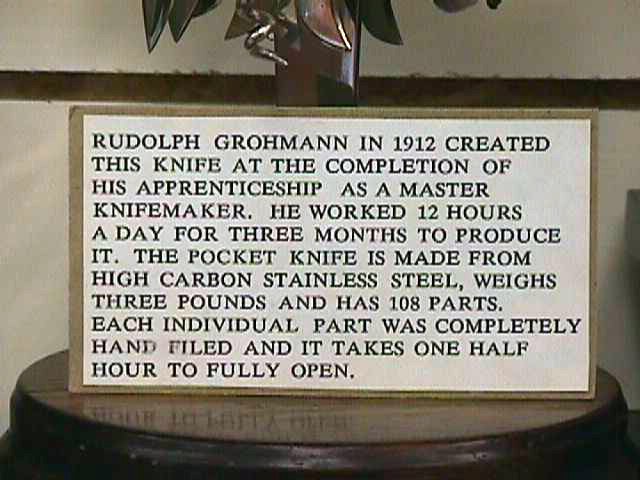 Blind Horizon featuring Val Kilmer also had various Grohmann Knives on set and provided thanks in their credits. 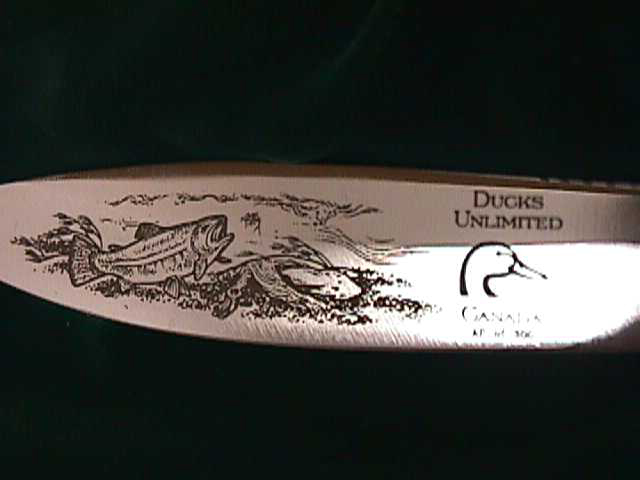 Made up especially for one of the owners, this 10,000 year old oosik handled Trout & Bird is quite a beauty. Instead of leaving the rough of the natural oosik (walrus penile bone), it has been polished smooth to leave a creamy oatmeal type appearance. Tree Shearing Knife. 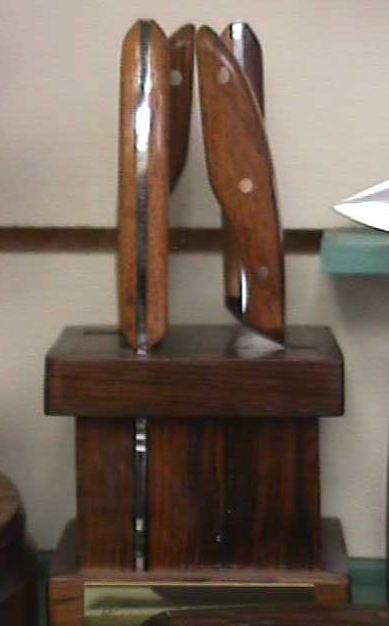 15" serrated high carbon stainless steel blade, 14" hardwood handle. This item was available for tree farms when there were many more in our area but has since been discontinued.